You lost two teeth a few years ago when a rebound ball caught you in the mouth during a pickup basketball game. You’ve had a partial denture for a while now, but want to upgrade to dental implants in Carlsbad. You know they will make your smile look fantastic and will be more convenient than your current replacement teeth, but did you know they’re better for your health, too? In this post, the team at Polished General Dentistry explains what dental implants are and why they’re good for your smile. Implant – A biocompatible titanium post will be secured in your jaw to create a solid foundation for the rest of the replacement tooth. Through a process called osseointegration, the post will fuse with the bone and grow stronger over the course for 3-6 months. 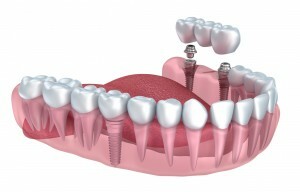 Abutment – This is the connector piece between the post and the tooth-shaped “cap.” It is affixed to the implant once your jaw has healed. Crown – The natural-looking porcelain dental crown will be attached to the abutment at the same visit. You’ll be done with the process, so it will be time to show off your improved, healthier smile. Why Are Dental Implants Good For My Health? Jawbone Strength – Unlike dentures and bridges that wear on the ridges in your jaw and cause it to deteriorate, dental implants actually strengthen the bone. They fuse with the tissue and make it stronger by maintaining proper pressure when you chew. Good for Surrounding Teeth – Unlike dental bridges and dentures that can trap bacteria, these replacements are healthier for your existing dentitions. They maintain proper alignment, keeping your surrounding teeth in their correct place, rather than allowing them to shift. This correct placement protects against chips, breaks, and uneven attrition (wear and tear). Appearance – With dentures, it’s highly common for the jaw and lower third of the face to move backward toward the neck, causing a “sunken” look. Since your jaw will be stronger (like we mentioned before), it will remain young-looking. And, the porcelain crown will be so natural, the only person who’ll know you have an artificial tooth is you. Now that you know why dental implants from your dentist in Carlsbad are good for your oral health, as well as natural-looking, schedule your appointment today to restore your smile!